Sarnia, Ontario, Canada, September 24, 2015 — An extended range of Type 4X outdoor equipment enclosures that comply with CSA, UL and NEMA standards is now available from field instrumentation protection specialist Intertec. 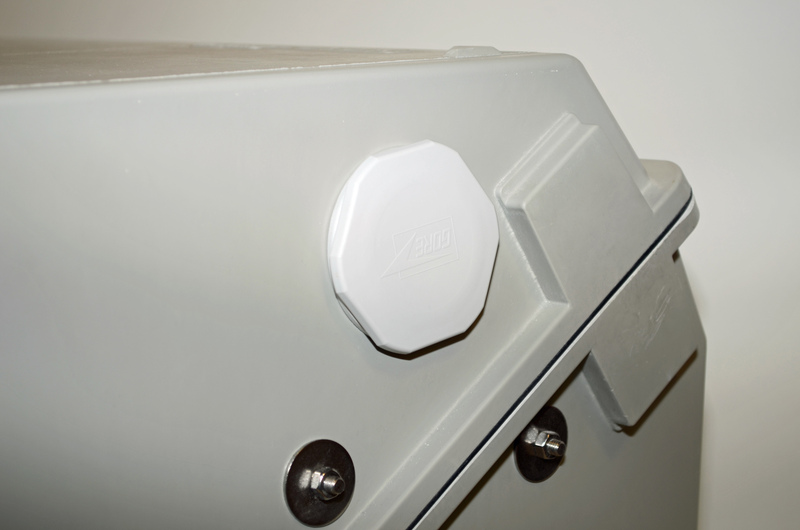 Manufactured from proprietary GRP (glass reinforced polyester), the enclosures combine high performance environmental protection capabilities with exemplary long-term resistance to corrosion. They are ideal for protecting instrumentation and electrical equipment sited in marine and coastal areas, where the presence of salt in the atmosphere can severely damage traditional steel cabinets and shorten their service life significantly. An additional advantage of Intertec’s Type 4X enclosures is that they provide superior protection when used in a Class I, Division 2 or Class I, Zone 2 hazardous area to protect equipment that does not constitute a source of ignition. Typical applications include housing non-arcing connections and connection devices such as joints, splices, terminals, terminal blocks and junction boxes. Following qualification testing by the Canadian Standards Association (CSA), a large and growing number of Intertec’s MULTIBOX and DIABOX enclosures are now available in Type 4X versions that comply with the relevant parts of the CAN/CSA C22.2 No 94.2-07, UL 50/50E and US NEMA 250 standards for electrical equipment enclosures. All three of these standards stipulate that the enclosures must provide enhanced protection against corrosion, as well as other environmental effects. Intertec’s MULTIBOX and DIABOX families are popular choices for housing process monitoring and control equipment in the field. Offering a wide range of containment capacities from 25 to 277 liters, they are designed for convenient mounting on walls/panels or small-footprint pipe stands. To comply with the CSA 22.2 94.2-07, UL50/50E and NEMA 250 standards, Type 4X enclosures must prevent the ingress of dust and be watertight against rain, sleet, snow, water splashes and hose-directed water. They must also be undamaged by the formation of ice on their external surfaces. This level of protection is broadly equivalent to the IP 66 rating of the international IEC/ANSI/EN 60529 standard. The hose-down test stipulates that all gasket seams be subjected to a high pressure water spray. This involves subjecting the enclosure to a steady stream of water at a distance of 3 meters from a 1 inch nozzle at a flow rate of 246 liters/minute. MULTIBOX and DIABOX enclosures feature a molded two-part construction, which means that they only have a single joint between their two halves, making it much easier to ensure a reliable seal. The mating surfaces are sealed by a continuous and highly durable silicon or EPDM synthetic rubber gasket embedded within a containing groove – this same design provides ingress protection ratings as high as IP68. Intertec goes to considerable lengths to ensure that the Type 4X versions of MULTIBOX and DIABOX enclosures maintain their IP ratings under extreme or fast-changing weather conditions. For example, if a hot enclosure is subjected to a stream of cold water, as might be the case during a sudden thunderstorm in a hot climate, the air inside will cool down and contract. In a conventional unvented enclosure, this can create a partial vacuum that causes air – and water – to be sucked past the joint seals. To prevent this problem, Intertec’s Type 4X enclosures are equipped with a special waterproof ‘breather’ seal that equalizes the air pressure and ensures that full sealing integrity is maintained under all operating conditions. Type 4X enclosures must also provide enhanced protection against corrosive agents. Metallic enclosures which are susceptible to corrosion are required to undergo a series of stringent material tests. The NEMA 250 standard, for example, calls for two salt spray tests, one with a duration of 200 hours, together with a test that involves subjecting sample material to a moist mixture of carbon dioxide, sulfur dioxide and air for 1,200 hours. 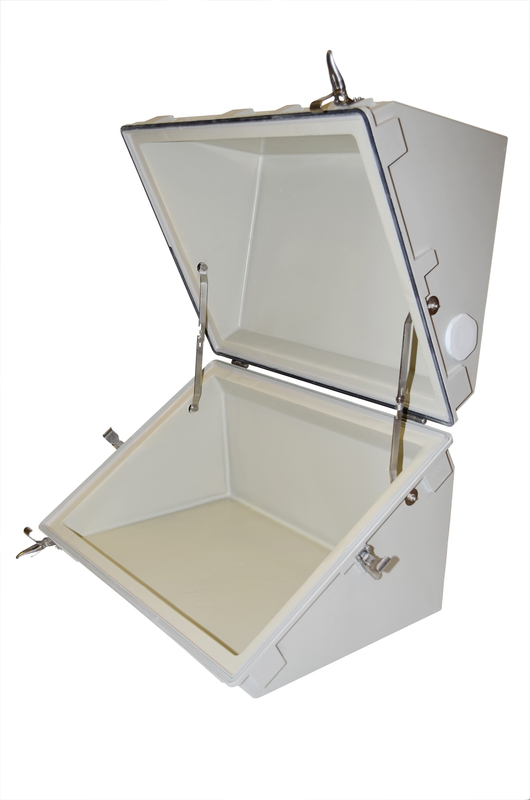 The GRP material that Intertec uses for all its enclosures is inherently resistant to corrosion from these types of atmospheric pollutants and therefore does not require qualification testing in its own right. Intertec’s GRP is a relatively inert material that has enormous advantages over the sheet metal materials commonly used for enclosure construction. It is highly stable and virtually immune to the affects of salt and most common petrochemicals and airborne pollutants. An excellent thermal insulator, GRP has a similar strength to stainless steel but is about 75 percent lighter, which helps to lower transport costs and simplifies installation. 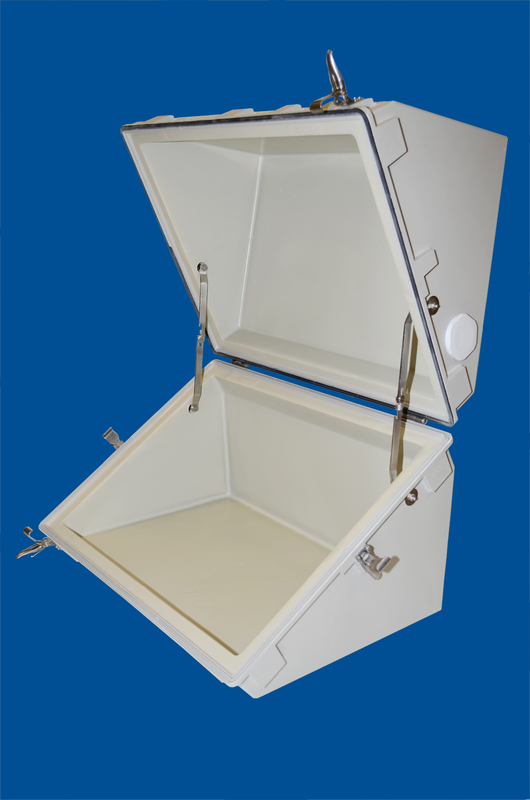 Intertec’s DIABOX enclosures are available with a wide choice of containment capacities from 27 to 277 liters. They feature a two-part design with hinges on their top edge and open diagonally to provide a very ergonomic and self-contained field protection solution. The lower half of the enclosure houses the instrumentation – process and electrical connections are usually made via the rear or base of the unit – while the upper half functions as a fully retained lid. MULTIBOX enclosures offer a similarly extensive choice of sizes, with 12 standard models covering containment capacities from 25 to 250 liters. Featuring a two-part construction, they can be mounted vertically or horizontally, with the instrumentation contained in either the deep or shallow section. Process and electrical connections are usually made via the top or bottom of the unit. 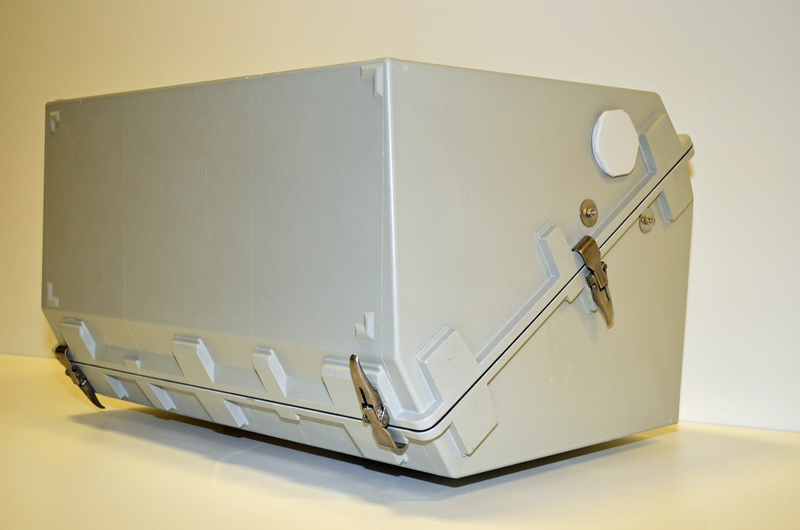 For applications that require protection against extremely cold climates, all MULTIBOX and DIABOX enclosures are available in ‘arctic’ versions that are suitable for use in temperatures as low as minus 60 degrees Celsius. Depending on the model, the additional thermal insulation is either provided by an internal polypropylene liner with a polyurethane (PU) foam infill, or the entire enclosure is manufactured from Intertec’s proprietary triple-layer composite-GRP material, comprising inner and outer walls of GRP with a PU foam core. Intertec’s range of DIABOX outdoor equipment enclosures now includes Type 4X versions that comply with CSA, UL and NEMA 250 standards. 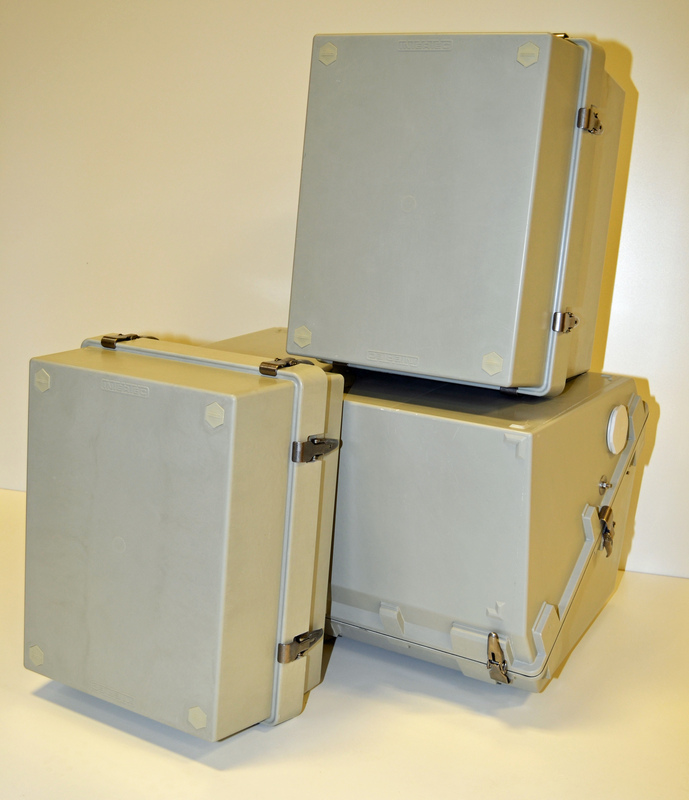 Intertec is now producing Type 4X versions of its popular DIABOX and MULTIBOX outdoor equipment enclosures that comply with CSA, UL and NEMA 250 standards. All Type 4X versions of Intertec’s DIABOX and MULTIBOX outdoor equipment enclosures feature a special waterproof ‘breather’ port to equalize internal and external air pressure.